CAD's E100 impressed us, but it's been revamped to create a mic with one of the lowest self‑noise figures in its class — or any other, for that matter! CAD — or Conneaut Audio Devices Professional Microphones, to use their full name — were formed in 1988 as the pro‑audio division of the Astatic Corporation, which dates back to 1931. The original founders, CM Chorpening and FH Woodworth, were ham‑radio operators who needed a static‑free microphone to work with their transmitters, and, working with local engineers, they developed the company's first crystal microphone, the model D104. Chorpening and Woodworth went on to develop and market a line of innovative crystal mics, phonograph pickups and recording heads, and contributed to the allied effort in World War II by producing an underwater sound-detection hydrophone and static-discharger for army and navy aircraft. As Astatic Commercial Audio Products, the company evolved into successful manufacturers of commercial microphones for a wide variety of industrial applications, including restaurants, airports, churches, schools, and corporate boardrooms worldwide. The professional and studio side of the company's business was introduced under the CAD name, initially with the Equitek Series of cost‑effective studio mics in the early 1990s. The company has recently rebranded itself as the all‑embracing CAD Audio, but with four series of products: recording, live performance, Astatic commercial, and personal audio. Over the years, we've reviewed many CAD mics in the pages of SOS, including the M177 and 179, the M9, the VX2, the drum- and guitar‑recording mic packs, and many more — including the original Equitek E100 back in June 1997. The new model, reviewed here, was launched late last year. It's essentially a radical update of the original model (which was itself revised to E1002 form when production was moved to China in 2003), and is the only survivor of the original trio of Equitek mics. The new E100S model has been engineered and built entirely in the USA, and employs a brand‑new capsule and proprietary new circuitry, which together endow the mic with the lowest self‑noise floor in its class — a remarkable 3.7dBA. This unusually shaped microphone retains the slim, rectangular form of its antecedent and measures roughly the same, at about 63mm wide by 154mm tall, weighing 0.61kg (22oz). It's a little slimmer than the previous model, having done away with the latter's battery compartment, and it now incorporates a compact integral shockmount. Thankfully, it has also replaced the garish gold grille of the original with a more sombre and professional matte silver and black grille, the back being matte black, along with the rest of the mic's body, which has a slightly rubbery finish. The new model has a fixed supercardioid polar pattern and requires standard 48V phantom power. Front‑panel toggle switches select a 10dB pad and an 80Hz, first‑order, high‑pass filter. The new one‑inch, nickel‑plated capsule drives a bespoke differential Quadra‑FET impedance-conversion stage, which is the key to its stunning low‑noise performance. The mic is supplied in a surprisingly deep but stylish cherry‑stained wooden storage box with a foam‑lined interior, and comes complete with a pair of replacement rubber bands for the integral shockmount. The shockmount has been described as a 'stealth mount', because it fits so snugly and cleverly around the mic body, but its neat design ensures that the maximum compliance is perpendicular to the diaphragm — as it needs to be for effective isolation. However, the XLR output connector is housed in a bulge on the rear of the mic body, protruding from behind the shockmount bracket, which can make it a little fiddly to insert and remove the cable. A 3/8‑inch thread adaptor was supplied for the shockmount. The published frequency response for the E100S is unbelievably flat from 40Hz to 4kHz (I sense a marketing man's ruler has been used here), but with a 4dB presence peak extending between 4kHz and about 12kHz, above which the response rolls off smoothly. The output is, surprisingly, nearly 8dB down at 20kHz, quite different from the original model, which was generally flatter and lacked the presence peak. The maximum SPL (no distortion limits are given) is 150dB with the 10dB pad engaged, and the nominal sensitivity is a reasonable 28mV/Pa. The E100S comes with a sturdy but unobtrusive and very effective 'stealth mount' shockmount, as well as a pair of replacement rubber bands. The original E100 was a remarkably versatile microphone that managed to deliver good, usable results with pretty much every source. The new E100S maintains that position, by and large, although the mild presence peak might not suit everything. The first impression is of a 'vintage' sound character: it lacks the harsh brightness that is endemic in so many modern capacitor mics. It sounds full and rounded, but without being muddy or bloated in any way. It's just a very nicely balanced sound. Given the very low noise floor — which becomes obvious through its absence very quickly in comparison to other mics — the E100S is ideal for quieter sources where a lot of gain might be required. 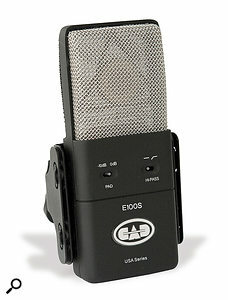 I found myself using it a lot for spoken‑word applications, and some of the recent SOS podcasts have featured this mic! The flat response below 4kHz lends male voices a relatively full lower‑mid body, verging on the 3D character of some of those revered classic vintage mics, while the presence peak brings out the diction very nicely, but without edginess. However, with the sung vocals of some vocalists, that same peak occasionally proved counter-productive, drawing attention to sibilance, or producing a slightly edgy character on some female vocals. These are not unusual traits in capacitor mics, of course, and it will always be the case that some mics suit some vocalists better than others. However, the E100S did manage to deliver a great sound with most sources, most of the time. On that basis, I'd rate it as a modern project‑studio 'C414', as it's a reliable all‑rounder that delivers the goods without fuss. The E100S also proved excellent for capturing the subtle detail of gentle acoustic guitar work, preserving detail with a nice, open and airy sound character, and I also got impressive results from a grand piano and some hand percussion. The smooth HF roll‑off, instead of being a disadvantage, proved time and again to be a major asset, delivering a natural, fatigue‑free sound, devoid of the resonant, fierce, 'tizzy' character that I associate with many modern capacitor mics, especially budget ones. The mic's sound always had enough presence to cut through a mix without needing handfuls of , but it never became edgy and nasty, and always remained essentially neutral and clear. The E100S isn't limited to gentle and quiet sources, either. Far from it, in fact: with a maximum SPL rating of 150dB, the mic can also be used to good effect close‑miking snares and toms — and the 'stealth' shockmount, combined with the neat rear‑panel XLR connection, makes that job easier than usual. The extended low‑end response, smooth mid-range, modest presence peak and high‑end roll‑off produce a crisp, detailed and powerful drum sound, without unnatural edge or crunch. The same was true of electric-guitar amps too: the mic yielded a rich, full‑bodied sound with plenty of detail and presence, but no edge; and the slim profile makes the mic very easy to place on a table stand in front of the cab. It also proved superb at handling trumpet directly on‑axis, capturing lots of power and detail, but with no brashness or break‑ups. Basically, this mic just excelled on everything I tried it with, and there aren't many mics — especially at this price — that I could say that about. The supercardioid polar pattern is handy for minimising spill in close‑miking situations — which is probably the role this mic will take most of the time — and it's a pretty tight supercardioid too, with the sensitivity falling off quickly as the source moves off axis. However, what off‑axis coloration there is isn't the most benign I've heard, and for that reason I probably wouldn't pick this mic to form the basis of a main stereo array for a live concert — simply because of the coloration that would result with audience applause. Despite being a supercardioid, the E100's proximity effect isn't as strong as I was expecting, and the shockmount proved very effective at reducing stand vibrations to negligible levels. 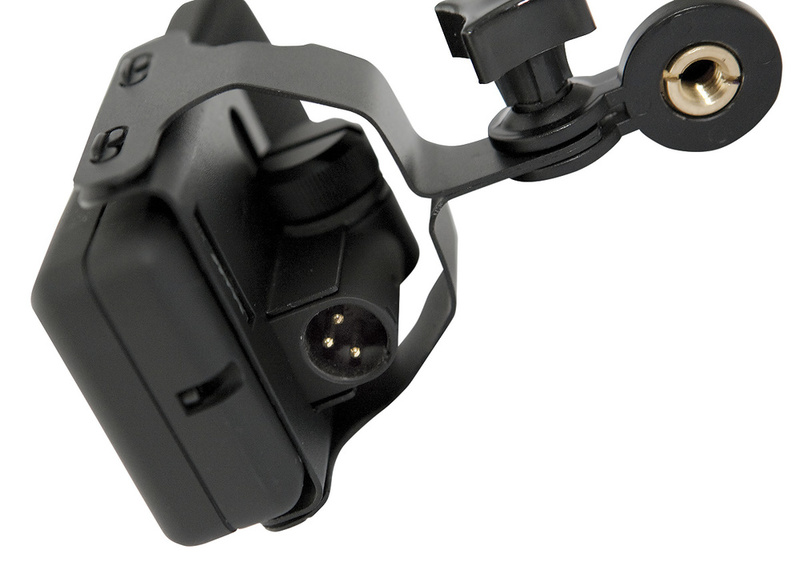 The mount can be removed, if desired, by undoing a large screw at the top of the XLR housing — and this process would be essential when replacing the rubber bands. However, I did it to compare the mic's performance when mounted within a standard Rycote USM shock mount and found little advantage over the bespoke design — and it was considerably bulkier, of course. Thankfully, removing the shockmount isn't something you'd have to do often, which is just as well, as the retaining screw is too long and the knurled head fouls against the back of the stand bracket, making the job rather tedious. The microphone grille is a fairly open weave (the capsule, mounted in a triangular secondary suspension, is clearly visible behind), and, as a result, close vocals do cause considerable plosive popping. A normal wind shield resolves the problem easily enough, though. The E100S is a very different beast from its earlier namesake, but its ability to serve as a reliable all‑rounder makes it a must‑hear mic if you're thinking of a spending spree this Christmas. Its smooth but detailed sound character is quite ribbon‑like in some ways, and provides a perfect antidote for those who find the shrill brilliance of many modern capacitor mics too much in combination with squeaky‑clean digital recording systems. The E100S is a remarkably quiet mic, with a full-bodied and detailed sound and an ability to cope with silly sound levels. There's nothing in my mic collection that sounds quite like this, or is as universally useful as this mic. For that reason, this one is definitely staying here! Given the E100's remarkably low self‑noise, its integrated 'stealth' shockmount, and its detailed but smooth sound character, I'd struggle to think of anything that really compares, let alone compares at a similar price. We've placed a number of audio files online at /sos/jan11/articles/cade100saudio.htm to accompany this review, so you can hear for yourself what the mic sounds like in comparison with other condenser mics. Gentle HF roll‑off provides smooth but detailed sound. Integrated and very effective shockmount. Supercardioid pattern useful for minimising spill. Grille not the most efficient plosive stopper — but I struggled to even come up with that as a con! The E100S is a phenomenally quiet microphone with a slightly vintage sound character that delivers a usable and attractive sound in almost every situation. Impressively versatile, uniquely shaped, and well priced. Wild Distribution +44 (0)1342 841637. CAD +1 800 762 9266.